Click here to download or print the entire design book in pdf (large download 10MB+). Click here to download just the most recent updates. This book is only for edge-to-edge designs and is only a small, representative sample of all the designs I own. 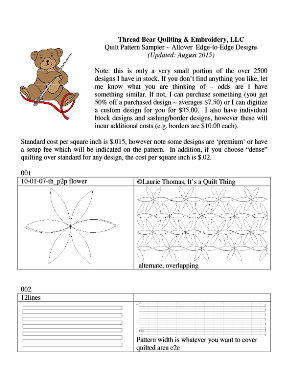 Please contact me if you don't find something you like or need border or block designs for custom quilting. I update these designs fairly often so be sure to check this page for updates.